I first posted this recipe in 2012. While I was harvesting the last of our beets from our garden I was reminded of it and thought it was worth sharing once more. We've been picking beets out of our garden and roasting them and then using the leftover roasted beets in creative ways. These moist delicious chocolate cupcake that will have your family wondering what the secret ingredient is. Preheat oven to 350 degrees and line 24 muffin cups with large cupcake liners. Mix together the dry ingredients and put it through a sieve into a large bowl. In another large bowl combine the beets, oil, eggs and sugar. Beat well until combined. Slowly pour in the cola and let the foam settle down. Add the buttermilk and vanilla. Slowly fold in the dry ingredients until the mixture is well combined. Fill the paper liners 2/3 full and bake about 15 minutes. Test with a toothpick to be sure it is clean. Make a simple frosting by beating together 1 envelope Dream Whip and one 4 serving size chocolate instant pudding and 1 1/2 cups milk. Once it is starting to thicken, add 1/2 cup whipping cream. 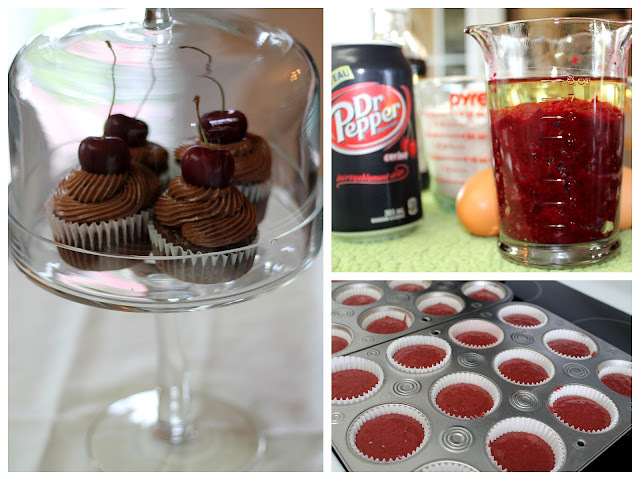 Once the cupcakes are cooled swirl with frosting and top with a cherry. Topping them with simple whipped cream is also beautiful and delicious....but don't forget the cherry on top! Your cupcakes look perfect! This recipe looks like a winner! The cupcakes sound wonderful...have you roasted beets for pickled beets...if so would you share that recipe. To me it sounds like a good option for red velvet cupcake lovers.. seeing the color is naural rather than food coloring. I have been hungry for cupcakes and this recipe sounds wonderful. I love unusual recipes ... and this one makes the list !! I have made a few beet chocolate cakes as I'm inclined towards sneaking in health whenever possible. This one looks light and tasty - cooked extra beets tonight with a view to making this soon. Your presentation is so winsome! Thank you Lovella!